Neobathiea grandidierana (syn. filicornu) outcross #2081 (approximately 25 seedlings per flask). This cross was made by Cindy Hill from plants in her collection. 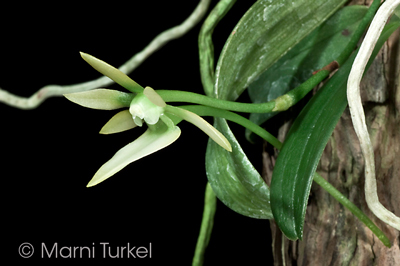 The Species: A charming Angraecum relative that is a miniature plant from Madagascar and Comoro Islands. 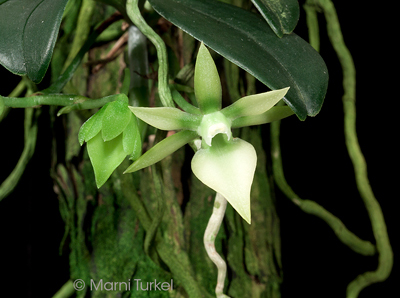 The species is found at elevations from 3300 to 5000 feet. 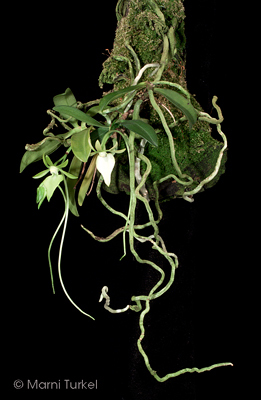 It grows as an epiphyte. The inflorescence carries a single flower with a long spur. It blooms in the spring. The flowers open green and after a few days turn to white. Culture: I grow this plant with 55 degree minimum night temperatures in moderately bright light. It likes to dry slightly between waterings, but not be left dry for sustained periods. I water it most every morning unless it has not yet dried from the day before. 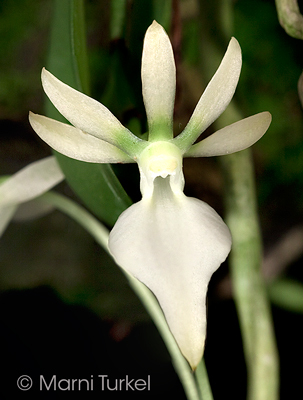 It is best grown mounted to show off the somewhat pendant flowers. Neobathiea grandidierana (syn. filicornu). I do not have images of the plants used for this but have images that show the species well.